Cuponne, A.; Vallverdu, M.; Gomis, P.; Porta, A.; Voss, A.; de Luna, A. B.; Caminal, P.
Repolarization dynamics may be of increasing interest in analyzing ECG-Holter for characterization of myocardial ischemic events related to cardiac death. The quantification of the dynamics of the beat-to-beat QT interval fluctuations, representing changes in repolarization duration, may be another emerging marker of cardiac events. Based on these arguments, we propose a symbolic analysis series to quantify the dynamics of the beat-to-beat QT interval fluctuations, representing changes in repolarization duration, and the prevalence of sympathetic or parasympathetic cardiac modulation in the RR series. This analysis decomposes the series in patterns of length L=3 beat and classify them into three categories: non-variable, variable, and very variable patterns referred to as P0, P1 and P2 patterns. The present work analyses QT and RR series obtained from 24-hour ECG-Holter recordings in order to obtained patterns able to stratify high (HRG) and low risk (LRG) of suffer cardiac mortality in patients with symptomatic myocardial ischemia. Comparing LRG and HRG, results showed that pattern P0 could better quantify QT series and pattern P2 the RR series. These findings suggest a decreased cardiac vagal function with a relative increase in sympathetic cardiac modulation, and more complex pattern of ventricular repolarization in the HRG. Cuponne, A. [et al.]. 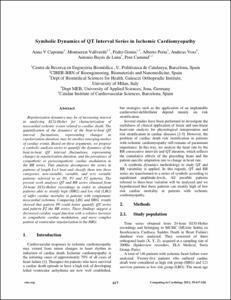 Symbolic dynamics of QT interval series in ischemic cardiomyopathy. A: Computing in Cardiology. "Computing in Cardiology 2012 Volume 39". Krakow: Computing in Cardiology, 2012, p. 617-620.